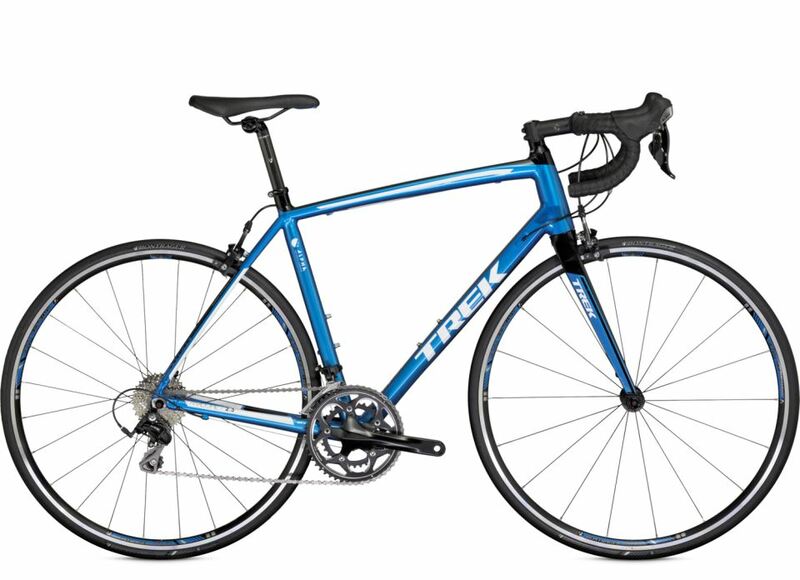 Trek has launched its 2014 series road bikes. The most remarkable improvement in the new Trek road bikes is the strong specs on the entry-level 1 Series. Now all Trek 1 series frames have a carbon fork, including the 1.1. There are also improvements across the Madone and Domane lines, i.e. the frames of the Madone 4 Series are aero now. Madone 7 is the highest level road bike that Trek produce, hand built from OCLV Carbon in Waterloo, Wisconsin, USA. The Madone 7 Team edition, pictured above, has been used by the UCI Pro team RadioShack-Leopard at the Tour de France 2013 and took a stage win with Jan Bakelants. It is equipped with Shimano Dura-Ace 9070 Di2 11-speed drivetrain, Bontrager Aeolus 5 clincher wheels with Bontrager R4 Black tires. Madone 7 is coming with 10 different builds, but the specifications, like all Trek models, are highly customizable, you can build your own bike at Trek cycles website. 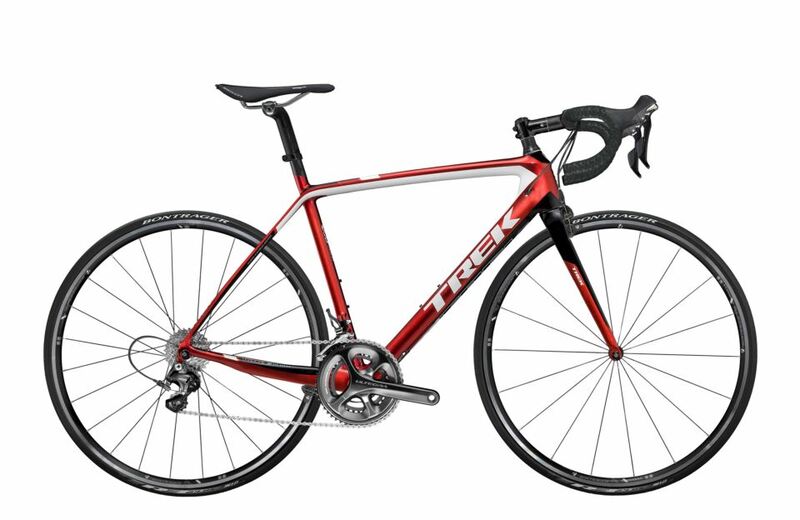 The US price of the Trek Madone 7 2014 Team edition is $12,421.48 (on Trek US page). Madone 6 is also hand built from OCLV Carbon in Waterloo, Wisconsin, USA. You can choose H1 or H2 geometry. The biggest difference is in the length of the head tube. With the H1 fit it’s 16cm on a 58cm frame; with the H2 fit it’s 19cm. In H2 geometry, the top tube is also a bit shorter and just a touch steeper head angle. That means your ride position is a little more upright to take the strain off your back and neck, without the need to use a stack of flexing spacers. The H2 setup is still performance-orientated, but it’s a bit more relaxed. The Madone 6.2, pictured above, is coming with Ultegra 6800 groupset, Bontrager Race Light TLR wheels with Bontrager R3 Black tires. 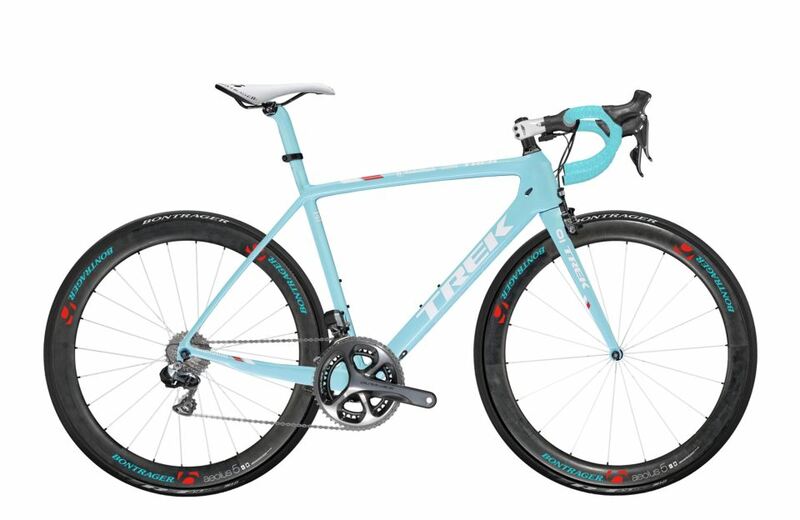 The price of this build is $4,897.19 (on Trek US page). 8 different builds are available. Domane is the endurance bike that Trek produce. It is specifically designed for the cobbled classics in Europe. Fabian Cancellara of RadioShack-Leopard won both Ronde van Vlaanderen and Paris Roubaix 2013 riding a Trek Madone. 11 different builds of Domane 6 series are available. The Team Edition (pictured above) is coming with OCLV Carbon frame, Dura Ace Di2 9070 11-speed groupset, Bontrager Aeolus 5 D3 Clincher wheels and Bontrager R4 Black tires. 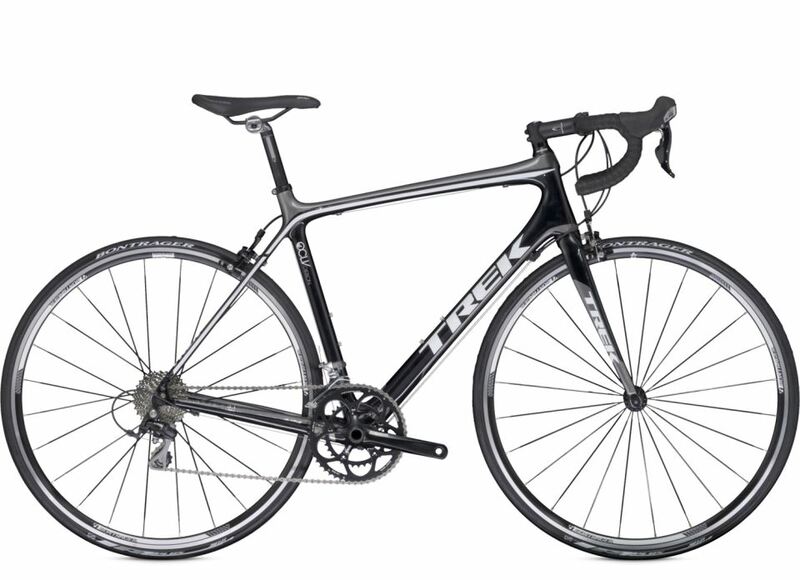 The US price of the Trek Domane 6 2014 Team Edition is $12,242.98. 3 different 5-series Madone are available: 5.9 (pictured above), 5.2 and 5.2 WSD (women’s bike). US price of the Madone 5.9 is $5,399.99. It is coming with 500 Series OCLV Carbon frame, Shimano Ultegra Di2 10-speed, Bontrager Race Lite wheels (Tubeless Ready) and Bontrager R3 700x23c tires. Trek Domane 5.9 (pictured above) specifications: 500 Series OCLV Carbon frame, Shimano Ultegra Di2 10-speed drivetrain (compact crankset), Bontrager Race Lite (Tubeless Ready) wheels with Bontrager R3 700x25c tires. Other 5 series Domane models are 5.9 WSD (Women’s bike), Domane 5.2 and Domane 5.2 WSD (Women’s bike). US price of Domane 5.9 is $5,499.99. 3 different Trek Madone 4 series builds: 4.7, 4.5 and 4.5 WSD (Women’s bike). The specifications of Trek Madone 4.7 (pictured above) are: 400 Series OCLV Carbon frame, Shimano Ultegra 10-speed compact groupset, Bontrager Race Tubeless Ready wheels, and Bontrager R2 700x23c tires. 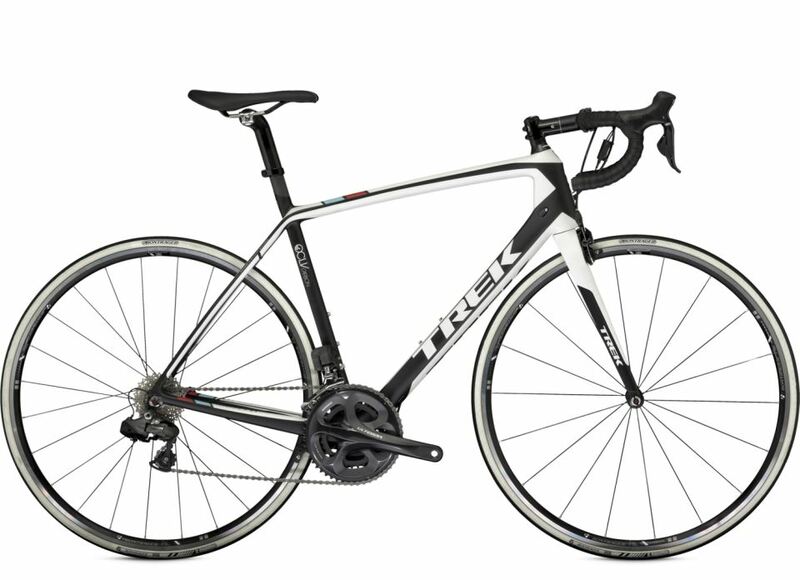 Trek Madone 4.7 US price is $3,999.99. Other build options are Domane 4.5 WSD and 4.3 WSD (Women’s bike) and Domane 4.0. US price of Domane 4.5 is $2,999.99. Madone 3 is the entry level bike of Trek Race Performance series. Two different models available: 3.1 (pictured above) and 3.1 WSD (Women’s bike). Specifications of 3.1 are: 300 Series OCLV Carbon frame, Shimano 105 10-speed compact drivetrain, Bontrager Approved alloy rims, and Bontrager R1 700x23c tires. US Price: $2,099.99. Domane 2 is the aluminum version of Trek’s endurance road bike. Like all Domane series, Domane 2 also features Trek IsoSpeed technology. Two different builds available: Domane 2.3 and Domane 2.0. Domane 2.3 (pictured above) specifications: 200 Series Alpha Aluminum frame with carbon fork, Shimano 105 10-speed compact groupset, Bontrager Approved alloy rims, and Bontrager R1 700x25c tires. $1,899.99 (US price). Aluminum Madone series. The same racing geometry with cheaper price. Specifications of Madone 2.3 are: 200 Series Alpha Aluminum frame (carbon fork), Shimano Tiagra 10-speed compact groupset, Bontrager Race Tubeless Ready weels, and Bontrager R1 700x23c tires. $1,849.99 is the US price. The other Madone 2 series build is 2.1. Lexa is a Women’s aluminum endurance road bike. The US price of the Lexa SLX (pictured above) is $1,699.99. Specifications are: 200 Series Alpha Aluminum frame with carbon fork, Shimano 105 10-speed drivetrain (Tiagra compact or triple crankset), Bontrager Approved alloy rims with Bontrager R1 700x25c tires. Other builds are Lexa SL, Lexa S and Lexa. The frame of Trek 1 Series is made from Trek’s 100 Series Alpha Aluminium, but it has been redesigned. The down tube, now comes with a curved leading edge and a truncated tail. It’s chopped off square at the back in a similar way to the KVF tubing that Trek use on their Madone and Speed Concept bikes. Three different 1 series are available: 1.5 (pictured above, US price is $1,349.99), 1.2 (US price is $999.99) and 1.1 (US price is $799.99). 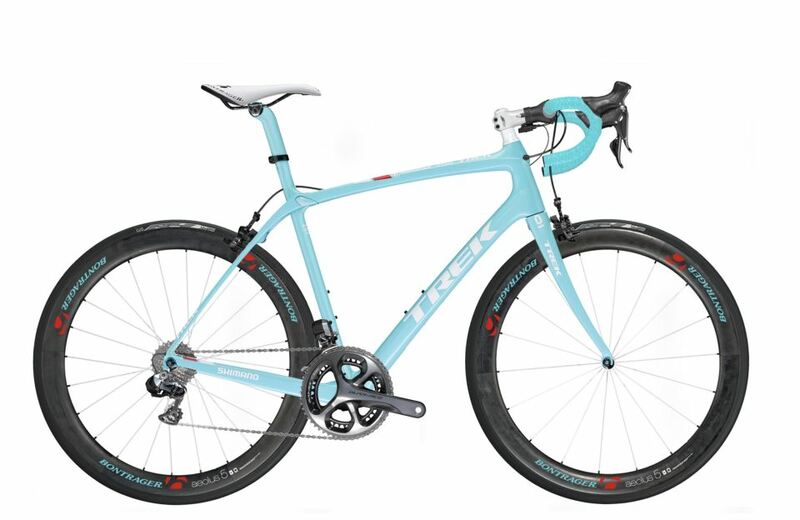 Specifications of the new Trek 1.5 are: 100 Series Alpha Aluminum frame with carbon fork, Shimano Tiagra 10-speed drivetrain with FSA Vero 50/34 (compact) crankset, Bontrager Approved alloy rims with Bontrager R1 Hard-Case Lite 700x23c tires. Trek 1.1 is the cheapest road bike that Trek produce. 100 Series Alpha Aluminum frame with aluminum fork, Shimano 2300 8-speed drivetrain with Vuelta Corsa, 50/34 (compact) crankset, Bontrager Approved alloy rims and Bontrager T1 700x23c tires. Only $799.99 in US. All prices are taken from Trek’s web site. For all the models, build options and colors check out Trek Bikes website.